Son of a house builder, Frank Edwin Wright III was raised with his two siblings in the rural town of Willits amongst many of the homes constructed by his father. One of the family's closest neighbors was Lookout! Records founder Lawrence Livermore, who picked the then-12-year-old Wright to be the drummer for his band The Lookouts in 1985 - despite (or perhaps because of) the fact that he had no previous experience with the instrument. 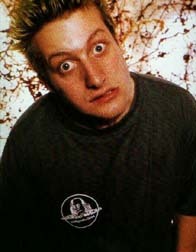 Under the unfortunate stage name Tre Cool (bestowed upon him by Livermore), he spent the next several years establishing a reputation for himself in Bay Area punk circles, both with The Lookouts and (on occasion) as a member of Screeching Weasel. Many of these shows took place at the community-run punk club Gilman Street in Berkeley, and it was here that he became well-acquainted with the members of another local punk band, Green Day; in 1992, after Green Day's original drummer John Kiffmeyer (whom Wright had once tutored on drumming technique) chose to pursue a college education rather than a music career, Billie Joe Armstrong and Mike Dirnt turned to their longtime friend as a replacement. That same year Lookout! released Kerplunk, the first full-length album to be recorded using this new line-up. Not long after Tre Cool had joined their ranks, Green Day's popularity exploded beyond the local punk scene, transporting the trio out of Gilman's graphitti-coated walls and threadbare sofas and into the slick, air-conditioned offices of major label mercenaries. Beginning with 1994's Dookie, the band became a full-time fundraising effort for Warner subsidiary Reprise Records, who placed them at the forefront of the new punk parade. Later releases served to maintain their commercial viability, although with a steady drift away from punk and towards more a mainstream rock style (most distinctly made evident on their 2000 effort Warning). The drummer drew considerable attention to himself when he decided to climb the globe on top of Universal Studios during the broadcast of MTV's music award ceremony in 1998; otherwise, he has kept the lowest profile of his three bandmates. Outside of his work in Green Day, Cool briefly sat in as drummer for fellow California punkers Samiam, and an appearance was made alongside Armstrong and Dirnt on a track for Iggy Pop's 2003 album Skull Ring.